When scientists first noticed a strange disease affecting sunflower starfish on the Pacific coast, the colourful creatures had just started to sprout "little white lesions" on their bodies. Not long after that, it was like a "zombie apocalypse," says Joseph Gaydos, science director of the SeaDoc Society at the University of California, Davis. "They're walking around and arms are falling off them," he told As It Happens host Carol Off. "Ones that are in a greater progression of the disease, they're just kind of melting into piles of ossicles." 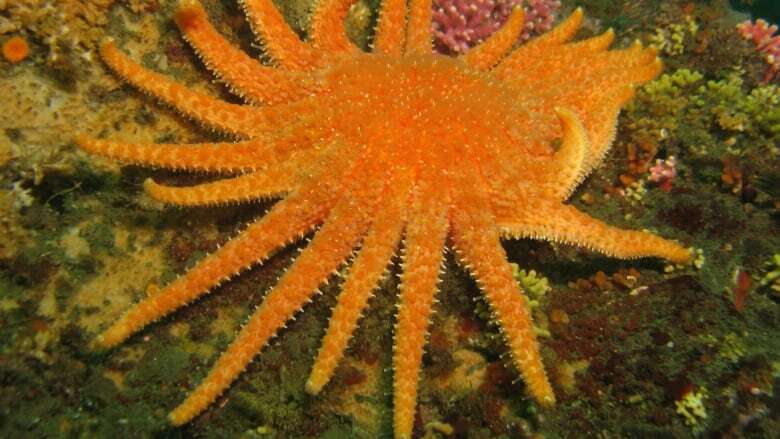 A few weeks later, divers recorded "a complete absence of these sunflower stars," he said. A study by Gaydos and his colleagues has connected the rapid spread of the so-called "wasting disease" behind mass die-offs of sunflower starfish to rising in ocean temperatures. The findings were published Wednesday in the journal Science Advances. Sunflower starfish, also known as sunflower sea stars, are among the largest starfish in the world and come in a variety of bright colours, including purple and orange. They can grow up to a metre wide and have as many as 24 arms. A decade ago, they were "super abundant," Gaydos said. "If you were to ask me then, you know, would these ever be rare, I would say no way, how could that ever happen?" But in 2013, scientists began noticing populations of the species declining between 80 and 100 per cent in deep and shallow waters, from Alaska and British Columbia right down to California. The nature of the disease itself still eludes scientists, but one of the research theorize an increase in temperature makes the sea stars more susceptible to the disease that was already present, especially since they don't have complex immune systems. With global warming causing a heat wave in the oceans, the future is not looking bright for the starfish. "Dealing with climate change is a huge thing. The other thing that I think we need to start thinking about now is what can we do to save these sunflower stars?" Gaydos said. "We kind of have a mandate to take care of animals and not let them go extinct on our watch and we really are not certain what can we done at this point." Gaydos said conservationists are looking at ways to preserve the species, possibly through selective breeding in captivity. But it's not just the starfish at risk. The once-bountiful population feeds on sea urchins, which themselves feed on kelp — a major source of food and habitat for other ocean life. 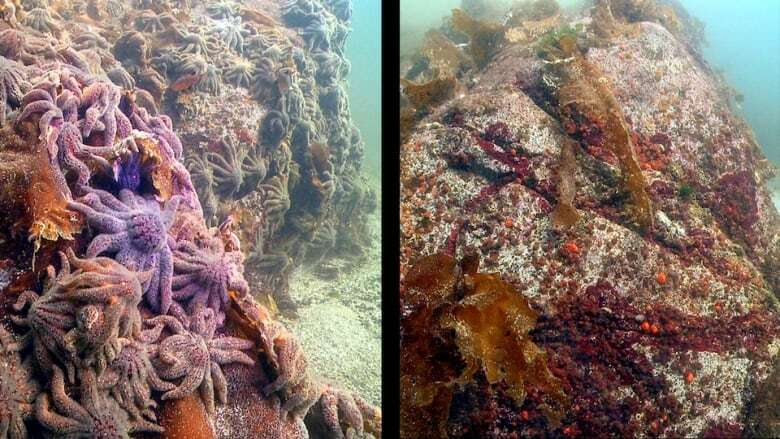 "So with the sunflower stars gone, in a lot of places, the urchin population exploded and then they just gobbled up the kelp forest," Gaydos said. "It's just kind of like clear-cutting a forest on land." The die-offs, he said, should be a wake-up call. "I think we can all make differences in everything we do with our life. We can push our governments to make differences. We can take the bus more. We can use less fossil fuels, ride our bikes," he said. "If we all start doing things, we're going to have some impact. We can't just throw our hands up." Written by Sheena Goodyear with Canadian Press. Produced by Allie Jaynes.